Your "Power" is not in your PowerPoint. There are many courses out there that can teach you how to use PowerPoint from a technical standpoint. This is not one of those courses. This course will start by giving you some background in how the mind takes in information and how the information needs to be delivered in order to gain the most attention and retention by the listener. From this vantage point we will create slides that engage the audience rather than put them to sleep or worse, kill them with PowerPoint. This course will help you create slide presentations that will move your audiences to action in a powerful and persuasive manner. 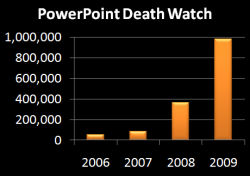 The video below is one of the funniest videos on everything people do wrong with PowerPoint.